If your company is active in project management, it is not unusual for your employees to be on the road for a project and generate time and expense items to be invoiced to the customer for whom the project is being implemented. In the view “Non Invoiced Time and Expense” in the Project Management work center, you can find all time and expense items that have not yet been assigned to a project. This means that they have not yet been invoiced to the customer. To edit not invoiced time and expenses click on „Edit Time and Expenses“. In the new window, you can see all items. You can see when the service was reported and which employee reported it. You can also see what the source document type is, such as time confirmations or expense reports. What is special about SAP Business ByDesign is that it automatically makes proposals for sales order items. You can also see these. However, you can easily change these by clicking on “Assign Sales Order Item”. 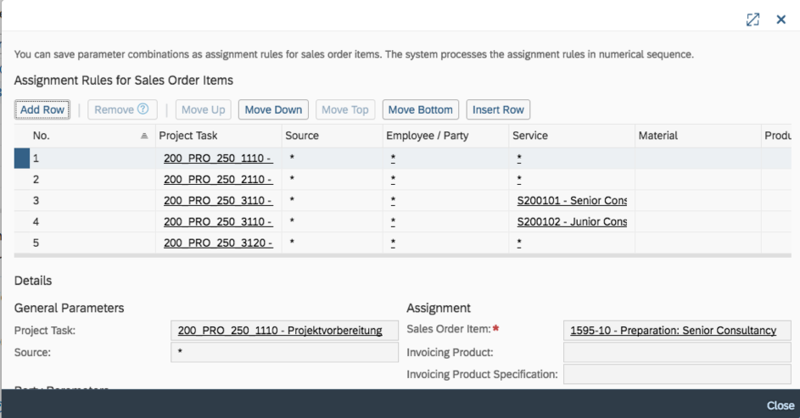 The sales order items proposed by the system are based on the assignment rules. These can also be edited by clicking on “Show All Rules” under “Edit Assignment Rules”. These rules allow you to save time and effort. Once all positions have been correctly entered and edited, click “Save and Close”. Then create a new project invoice request. The system summarizes all items and the corresponding prices. You can also see which employee has registered which times. The data can be edited before the invoice is released. Then click on “Check”. If all items are consistent, you can release the invoice by clicking on “Release”. The invoice will then be forwarded to the finance department.